What the Heck is mHealth? Wanted: White knight (shiny amour optional) to save us from ourselves and the wretched lifestyles we choose. Your coffeemaker went dead on you this morning, and while lamenting your drowsiness at work, your friend Denise mentions that she just bought a new coffeemaker at Target and she absolutely loves it. You take your coffee the same way Denise does, black, strong, and all day long, so you decide to buy one for yourself. You are a busy professional and you don’t have time to go to Target, search for a good parking spot, walk to the store, walk around until you find the small appliances, pick it up, stand in line, walk back to the car, struggle to back out from the too narrow parking space, and drive home through congested intersections. It could easily take half an hour out of your already busy day. So you decide to buy it online in the evening. You get home, feed the kids, answer a couple of urgent emails from your boss, and after everybody goes to bed, you settle down to finish those spreadsheets you meant to complete at your office, but ran out of time. In between emails and spreadsheets, you remember your coffeemaker, browse to Amazon.com, search for it, find it, and are getting ready to order when you notice that the ratings are not stellar. It seems that 347 shoppers, just like you, gave it only 3 stars. Surely you can do better than that. So you search for coffeemakers in general, find a whole bunch, sift through ratings after ratings, and learn that people that bought a coffeemaker also bought filters and funny little measuring spoons. An hour later, you settle on some other coffeemaker, throw in a gold filter that never needs replacing, some organic rainforest coffee, and a box of genuine Italian biscotti that the raters say go great with your green coffee, and order the whole bunch from Amazon, which gives you free two days shipping with one click of a button. You feel very efficient and very accomplished. You just spent twice as much time as shopping at Target would have taken, sitting on your chair in the comfort of your home, spent twice as much as you intended, and for the next three months or so, every time you open a browser, some well-meaning retailer will be providing you advice on what else you need to buy to make your coffeemaker happy. You have proven that you are a good and savvy consumer, and now you can advance to the next level, and try your hand at consuming health care. The first order of business is to place health care at your fingertips so you can shop for it while sitting motionless on a chair, in the comfort of your home. Going to an actual doctor is as inconvenient and as detrimental to your worker productivity as going to an actual store, and probably much worse, because once you enter the doctor’s office, you are denied the freedom of choice that comes from being able to compare ratings and opinions of other savvy shoppers like you, and barred from accessing the benevolent advice freely available on websites. Health care shopping is the ultimate level in this game, so it requires new tools, collectively known as mHealth, or mobile health. Mobile, not because God forbid you may have to move to use them, but because these sophisticated tools do all the moving for you, much better than the old fashioned Amazon.com ever did. mHealth can attach itself to your pocket, your clothes, your wrist, your underwear, your skin, your eyes, and can even nestle comfortably inside your body. mHealth does not need you to summon it into existence like Amazon.com did. mHealth is always there, tirelessly working on your behalf, anticipating every muscle twitch, every thought and every desire you may have, providing you with healthy advice and support in your times of need, even in your sleep. Like a good butler of days gone by, mHealth makes it its business to quietly learn everything there is to know about you, so it can provide you with a level of personalized service, once only available to fabulously wealthy individuals, and now available for free to every convenience seeking pauper. As of February 10, 2014, the Apple iStore contains 29,504 health & fitness apps, and 23,420 medical apps. Together, these apps are known as mHealth. Most are free, some cost a few cents and some have substantial pricing. Most are standalone, simple things, and a few are part of larger elaborate systems of smart hardware, some wearable, others to be used at certain times only. They range in scope from expert advice on where to buy pesticide free eggplant to FDA approved medical devices for measuring the function of your heart. There is only one thing all mHealth apps have in common: they all collect information about you. Collectively, mHealth knows when you are sleeping and knows when you’re awake. It knows what you are eating, when you eat it, and where you are while you eat it. It knows if you are walking or running or just sitting down. It knows your vital signs, your mood, your diagnosed ailments and all the medications you are taking. It knows who your friends are, what they look like and sometimes what they are eating too. It knows more about you than your spouse, your mother or your children. And since mHealth is a social animal, it is happy to share all that knowledge with the world, so the world can better cater to your specific needs. And the world is eager to reciprocate and share everything it knows about you with your mHealth. From Amazon.com to Target, the IRS, the DMV, MasterCard, the Department of Homeland Security, your alma mater and even your own car, everybody will be joining forces to serve your health in more and better ways. There is one small problem though, and that’s your secretive relationship with your doctor. For some reason, doctors insist on talking to you alone, behind closed doors, like criminals. They say things, you say things, maybe you all look at things, and nothing gets transmitted to your mHealth. The world and mHealth can’t really help you if you keep secrets from them. The government, acting on behalf of the world at large, is now installing computers in doctors’ offices and mandating disclosure of your secretive conversations. That’s a good first step, but the ill-fitting EHR technology is still unable to communicate with the world, let alone your mHealth. To speed things up a little, the government is paying doctors to make you manually transmit your previously secret information to your mHealth. With one click of a blue button, you can liberate decades of your most private secrets, and send them to roam free through all the mHealth apps out there and combine themselves in most fortuitous ways with data from Amazon, Target, Verizon and all other agents toiling on your behalf. And if you think this is some sort of utopian wishful thinking, I suggest you read the recent issue brief from the Office of the National Coordinator for Health Information Technology (ONC), about the government’s plans on “Using Health IT to Put the Person at the Center of Their Health and Care by 2020”. It’s only eight pages long, with large fonts and soaring rhetoric that mentions the word physician only once and makes no reference to doctors, because this is all about you, the person and future patient. By 2020, the ONC envisions that “The power of each individual is developed and unleashed to be active in managing their health and partnering in their health care, enabled by information and technology.” You get goosebumps just thinking about the tens of thousands of elderly folks with heart disease, cancer, and dementia, suffering in silence and yearning since the Second World War to have their powers developed and unleashed. This wonderfully clear ONC manifesto, lays out a roadmap to a “brighter, more inclusive future”, enabled by the “emergence of health IT, including consumer eHealth tools” (a.k.a. mHealth). This is just a happy roadmap and ONC is not certain if “consumers and providers will fully embrace the resulting cultural shift”, but they are “optimistic that stakeholders will rise to these challenges”. I am too, and Mr. Kurt Vonnegut was already optimistic back in the middle of the previous century. 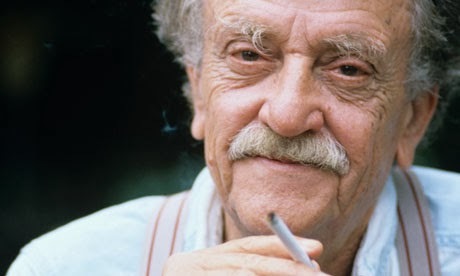 Unfortunately, Mr. Vonnegut died before his power could be developed and unleashed, and thus was spared the joy of watching the stakeholders rise with the shifting cultures, but wherever you are Kurt, here is a rainforest coffee toast to your prescience. Amen. There is a new report out from the Congressional Budget Office (CBO) titled “The Slow Recovery of the Labor Market”, and as its title implies, it predicts a slow recovery from a labor perspective. Among other things, the CBO report is now making headlines in the political game of Obamacare because it forecasts a 2.5 million job reduction by 2024 due to the effects of the health care law. You should read the report itself (it’s not very long and it has lots of pictures), because it is practically impossible to find objective coverage of its contents in today’s media, which is full of ideology driven experts and completely devoid of old school reporters. I don’t know about you, but I for one am growing tired of the incessant drumroll crediting or blaming Obamacare for everything from the price of gas at the pump to the demise of penguins in Argentina, so let’s show some magnanimity and absolve Obamacare from, at least, the following 10 naturally occurring phenomena. Number 10: The CBO labor forecasts – Starting with the most recent development, we should observe that the CBO report is not stating that Obamacare will create a shortage of jobs or increase unemployment, which will remain high independent of Obamacare. These 2.5 million jobs are projected to be voluntarily forgone by people, or as the White House press secretary put it, “Americans would no longer be trapped in a job just to provide coverage for their families, and would have the opportunity to pursue their dreams”. And for 2.5 million able bodied folks, those dreams are projected by the CBO to include no work. Instead of having to toil from dawn to dusk in large offices or start small businesses of their own, Americans now have a choice, and we should rejoice in utter disbelief that in a country where one in five children is living in poverty and unemployment is rampant, citizens finally have the liberty to earn no income. Number 9: Health insurance cancellations – Much ado about nothing was made of millions of insurance cancellations sent in bulk to those who purchased health insurance on the individual market. In case you weren’t aware of it, this type of mass turnover has been occurring in this hapless segment of the market since the beginning of time. Every year, all insurance companies rescinded all policies for all their customers. 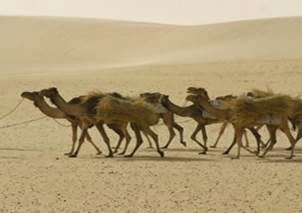 If your experience is different, then you are definitely an outlier. Besides, it is a well-known fact that individual market policies, as opposed to those issued by benevolent employers, such as Walmart or McDonald's, were pure garbage before Obamacare, as any retired executive, or middle class family can tell you. Number 8: Health insurance premium hikes – Seriously? We wouldn’t be having Obamacare if insurance premiums wouldn’t have crippled our economy, impoverished the nation and rendered Apple and Google incapable of competing in the global markets. It is true that Obamacare is forcing insurers to pay out a fixed share of revenues to doctors and hospitals, but Obamacare is also delivering millions of fully subsidized customers to private insurers, allowing revenues to grow through volume in addition to the customary growth in unit margin. This should help avoid wanton increases in premiums beyond originally projected ones. Number 7: Price of Care – Yes, prices for medical services are exceedingly high in the U.S., but Obamacare was obviously not the catalyst for those. The hospitals started this trend many years ago, and private insurers who like any honest enterprise, get to keep a percent of their revenues, had little incentive to curb the hospitals’ enthusiasm. It is true that Obamacare is providing incentives to hospitals to consolidate into price gauging monopolies, but aren’t monopolies the natural outcome of a free market? The cost of health care in the U.S. was almost double its nearest European competitor before Obamacare, and it still is, and Obamacare had absolutely no ill effects, or any other effects, on that sad statistic. Number 6: Narrow networks – It seems that people signing up for new Obamacare plans are having trouble getting to see their old doctors, because health insurance companies have concluded (based on extensive and nonexistent research) that folks prefer cheap insurance over actual medical care. Thus, all consumer centered benefit designs include less doctors, less hospitals (particularly popular ones), less of what consumers don’t need or want, and more insurance stuff, such as peace of mind. This cost containment strategy has been initiated long before Obamacare was even contemplated (remember the nineties? ), and it worked exceedingly well when combined with #8 above. All Obamacare did, was to create the healthy transparency needed for us to observe this highly beneficial trend towards value for our most esteemed citizens, such as AARP and United Healthcare. 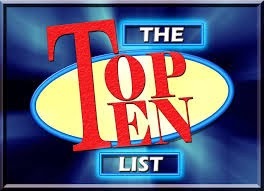 Number 5: Shortage of doctors – Ah, the scare tactics of the rabid right are at work again. Supposedly, Obamacare and its millions of uninsured will be flooding doctors and hospitals, squeezing paying customers out of their place in line. Nothing could be farther from the truth. First, as any Obamacare advocate can tell you, we’ve been having a shortage of doctors long before Obamacare kicked in a month ago, so this has nothing to do with the health care law. Second, Obamacare contains many provisions aimed at finding ways to liberate doctors from the practice of medicine, and to liberate medicine from practicing physicians, so consumers can avail themselves of health care uninhibited by ancient guilds. Also, when insurance plans are firing doctors from their networks by the thousands (see #6 above), how can any free-marketer in his right mind suggest that there is a shortage of doctors? Number 4: The insurance gap – This is the bleak spectrum of folks who are not poor enough, old enough, young enough, or otherwise demographically endowed enough, to enjoy the opportunity of pursuing their dreams of not working while having the peace of mind that comes with an insurance card. Obamacare tried its hardest to liberate these folks, but a conservative Supreme Court and recalcitrant Governors in red States have come together to obstruct the expanded Obamacare subsidies in many States. It looks like the Governors are beginning to soften their stance though, so we should see more Medicaid cards issued soon. Either way, Obamacare did not cause folks to be in this category to start with, and if you must blame someone, blame the Governor or the judicial branch of government. Number 3: The Website – We’re talking about a website, a minor technical detail that has absolutely nothing to do with the essence of Obamacare. Yes, Healthcare.gov and several other local health insurance exchanges have been a good example of how not to build and deploy software. It was a learning experience for the nation, and there is clear value in that. As any entrepreneur can recite in his sleep, failing early and failing often is the only way to achieve success. And the website seems to have accomplished that, at the modest cost of less than half of what it would cost to build, say, a new Space Shuttle. Number 2: Redistribution of wealth – Yes, Obamacare is providing subsidized insurance to the poor, and yes, Obamacare is forcing the young and healthy to pay more so that the old and sick can be charged less, and if you look at the chart published by the Brookings Institute, your heart will sing with joy at the sight of two huge positive columns of gains for the very poor, and the tiny loss columns for everybody else. Until you read the full report, that is. Those huge income gains for the poor, you see, include the money paid by the government on their behalf to insurance companies, and as Brookings wisely shifts the terminology, these are gains in “well-being”, not cash in your pocket. We could use similar logic to divvy up what the government pays defense contractors, agribusinesses, all foreign aid, government salaries, and pretty much the entire federal budget, and show a vast increase in “well-being” for the poor. The President’s recent lukewarm inequality rhetoric notwithstanding, rest assured that Obamacare is not even remotely trying to alter the Darwinian redistribution of wealth in use today. Number 1: Dysfunctional government – Obamacare, although the most hotly debated federal undertaking in recent memory, cannot be blamed for the present impotence of our federal government, no matter what they tell you from the right or left side of the aisle, or the TV. If President Truman were alive today, he could write volumes on his own “Do Nothing” Congress. Obamacare is actually the one rare incident where a significant law has been passed in the five years following the election of President Obama. It is testimony that Congress can indeed legislate, and it is proof that our government is working as redesigned by an invisible hand. Sure, Obamacare has been the favorite football for the biggest exhibition game on earth right now, but you don’t usually blame the football if your team just doesn’t show up in New Jersey. Meaningful Use Stage 2 is now on the clock. Three years after the program began in 2011, and a year later than originally planned, the escalator has finally moved up one level. Surprisingly, the usually boisterous and highly hyped health information technology (HIT) media is largely silent on the subject. It’s almost like everybody gave up, or perhaps the entire Meaningful Use exercise is now assumed, and the buzz has shifted to sophisticated analytic apps, preferably mobile, that will utilize all the big data collected by EHRs to perform medical or fiscal miracles. Of course, the best engineered and the sleekest looking Ferrari cannot run without fuel, and since Meaningful Use participation is the fuel for all the cutting edge innovation floating around in the intelligent apps market, it may be useful to take a quick look at the Meaningful Use state of affairs for 2014. Let’s get some numbers laid out first, so we can have an informed discussion. According to CMS, back in 2011, the first year of Meaningful Use, approximately 60,000 physicians attested to Meaningful Use of a certified EHR and 50,000 more attested to buying or upgrading to one. That’s at least 110,000 doctors that purchased a certified EHR in 2011, and probably more. By December 2013, 213,000 unique physicians attested to Meaningful Use in the Medicare program, over 20,000 for the first time in 2013, and most likely a bunch more newbies will be added in January and February of 2014. For Medicaid, 100,000 doctors attested to something so far. If everybody continues to participate in the program, we are looking at upwards of 350,000 physicians, not counting new ones in 2014, that will be needing an upgrade to a 2014 certified EHR, which is the only allowed EHR edition in 2014, whether one is attesting to Meaningful Use Stage 1 or Stage 2. The number of 2014 certified ambulatory EHRs is approximately the same now as the number of certified EHRs was in January 2011. While the supply is the same, the demand should be 3 times higher. For anyone vaguely recalling the difficulties experienced by many in obtaining a “certified” EHR version in 2011, the three fold jump in demand should immediately become cause of concern. This is most likely why CMS is allowing all Meaningful Users to attest for only 3 months in 2014, regardless of the Stage they are at. Theoretically, one would have until the first week in October 2014 to begin this year’s attestation period. Unfortunately this is not exactly the case for everybody. If 2014 is your first year of Meaningful Use, you must complete your attestation by October 1st to avoid the penalty. You could roll the dice and start your reporting period as late as July 1st, hoping and praying that the reports will be satisfactory, planning to work late on September 30th to get all your stuff ready, and keeping your fingers crossed that there will be no snags with the attestation site that evening. If the stars fail to align, you will be penalized. I am not certain about this, but I wonder if the possibility exists that you will be both penalized and incentivized in the same year. If this is not your absolutely first year of Meaningful Use, all attestation periods are tied to calendar quarters in 2014, so you can either start on January 1st, April 1st, July 1st, or October 1st. You cannot just run reports until you find a “good” 90 days period. If one of those four periods is not good enough, that’s too bad, you’re out for the year, and since this is a new EHR version, chances are some unexpected “glitches” may occur. In the past, people devised several “workarounds” to improve on Meaningful Use reports prior to attestation. Those workarounds included, retrospective data updates for things like problem lists or demographics, and the perennial favorite of “print to file”, where clinical summaries are sent to a virtual PDF printer to increment the EHR count with minimal deforestation effects. Since attestation periods are fixed now, and since those attesting to Stage 2 are looking at significantly higher thresholds, and some new ones to boot, one should expect a much higher incidence of innovative fixes to workflows. Another thing to keep in mind is that clinical quality measures (CQM) reported this year, partly for PQRS, may become public. While in the past, the numerator for these measures was irrelevant to attestation success, good performance is very important now, and carelessness with the numbers may very well come back to haunt you in the not too distant future. Fortunately, CMS has increased the pool of CQM sanctioned for reporting, so everybody, including specialists, can pick measures pertinent to their practice. Unfortunately, with the exception of a handful of EHRs, most vendors chose to not certify for all possible measures, so this year, just like in 2011, most physicians will have no choice of CQMs. Keep in mind that the reporting requirements for CQMs in 2014 is the same for all participants (i.e. 9 measures, electronically submitted), regardless of Meaningful Use Stage, except for first year participants, who are exempt from the electronic requirement. Speaking of choices, those planning to attest to Stage 2, are allowed to pick 3 measures out of 6 menu choices, two of which are practically impossible to choose, since not many States have the ability to receive electronic data to cancer, or some other registry (other than immunizations), and also because almost all 2014 certified EHRs chose to not certify themselves for these measures. Realistically, there are no menu choices for Stage 2, and we should have probably never expected any, based on recalling that back in 2011 many EHRs were certified for functionality they didn’t really have (e.g. immunizations interfaces in all 50 States). Another baffling set of numbers comes from this year’s National Ambulatory Medical Care Survey (NAMCS). 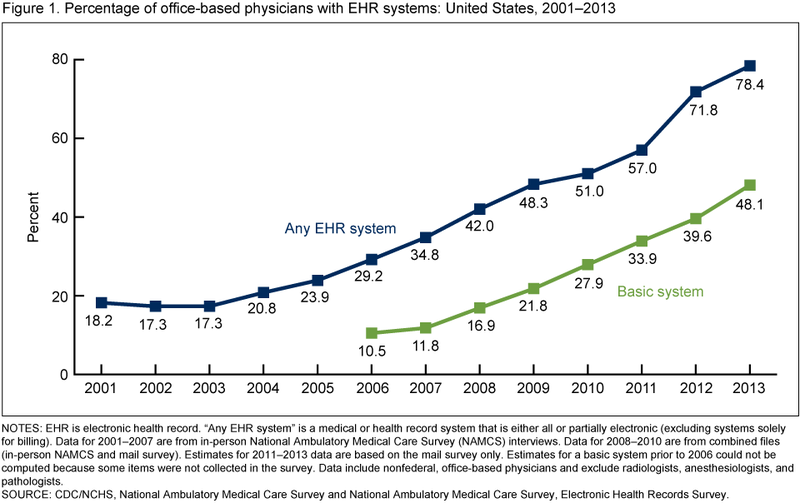 A joyfully reported 78.4% of physicians in the U.S. have an EHR, and 48.1% have a “basic” one (i.e. an EHR with functionalities that could satisfy basic Meaningful Use requirements), or better. The question that always springs to my mind looking at this graph is what on earth do 30% of doctors have in their practice? Microsoft Office? There is practically nothing you can buy today that does not meet the definition of “basic”, yet the gap between basic EHR and any EHR, shows no signs of narrowing down, which in my mind, makes these survey results questionable at best, but I digress. The 48.1% of basic EHR users matches very well with the approximately 350,000 physicians that are participating in the Meaningful Use program. 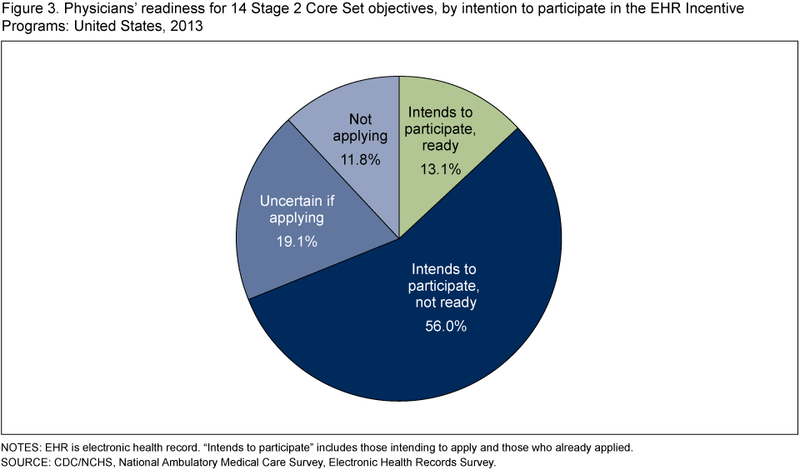 The NAMCS also finds that 13.1% of physicians are ready for Meaningful Use Stage 2, which means that practically all physicians that started their Meaningful Use journey in 2011 were using a 2014 certified EHR and were ready to move up the ONC escalator at the time they were surveyed. Considering that the “2013 NAMCS EHR survey was conducted from February through June 2013”, I doubt that very much, seeing that there were no 2014 certified EHRs on the market at that time. Perhaps those optimistic doctors meant that they are confident that they (and their EHR vendors) will be ready when the time comes. Either way, we are left with over a quarter million doctors who don’t think they are ready for Meaningful Use Stage 2, and perhaps unbeknownst to them, they are also not ready for Meaningful Use Stage 1, which requires this year a brand new, 2014 certified EHR, and another two hundred thousand physicians who think they have an EHR, but really don’t. If 2014 was designed to stress test the $18 billion (so far) Meaningful Use program, odds are the crash will be spectacular. If, on the other hand, the thinking was that as long as the camel is on the move up the escalator, we can happily add bale of straw after bale of straw to its back ad infinitum, we’re in for a bit of a surprise this year.